I know he wasn't exactly the picture of health or sanity these past few years, but I am truly shocked about the passing of Michael Jackson. He was my first love. I can remember being a tiny little girl watching Thriller premiere and being scared and running upstairs, but then coming back down and watching it again (MTV played it twice in a row). 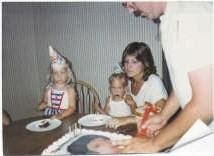 I loved him so much I had a Michael Jackson cake for my 3rd birthday. I even kissed the cake. I had MJ posters on my wall and a MJ barbie doll complete with only one glove. I can't say I was a die-hard fan much past the age of 6, but it's still sad to lose such a musical icon at such a long age. I know he has been troubled, but I hope he is remembered for his music and not for the drama. Very well said. Awesome cake!! Its so sad. I am still in shock and can't believe it. He was an amazing artist. That is an awesome cake! Aren't you glad I asked mom to scan those pictures for you? What color is your hair? Electric Copper!